Recently, Union MicroFinanza has begun collaborating with the second year colegio (high school) students who are following a career in Social Promotion. Gilberto and Martir (our loan officers) studied this same curriculum with the intention of serving their community as a member of their community and have subsequently embarked and succeeded in accomplishing their personal and communally-shared dreams. The idea is wonderful, but many of these students express a lapse in what their role in this community will be. However, over time it will be exciting to see both boys and girls continue aspiring to help villages in need of much help; the same villages Union MicroFinanza is aiming to help through agricultural loans. The connection between UMF and these students is two fold. First, we are training them on the same subjects which we are training our producers. So far, we have taught about planting, then we elaborated on plant diseases and plagues, and finally we instructed both producers and students on both the benefits and processes of making organic fertilizers. 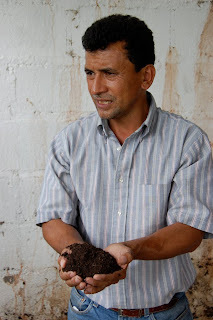 The idea is to help spread these trainings throughout the villages with the help of Gilberto and Martir. Most students were in attendance, while several others went above and beyond our expectations in terms of the interest they had in what we were doing. 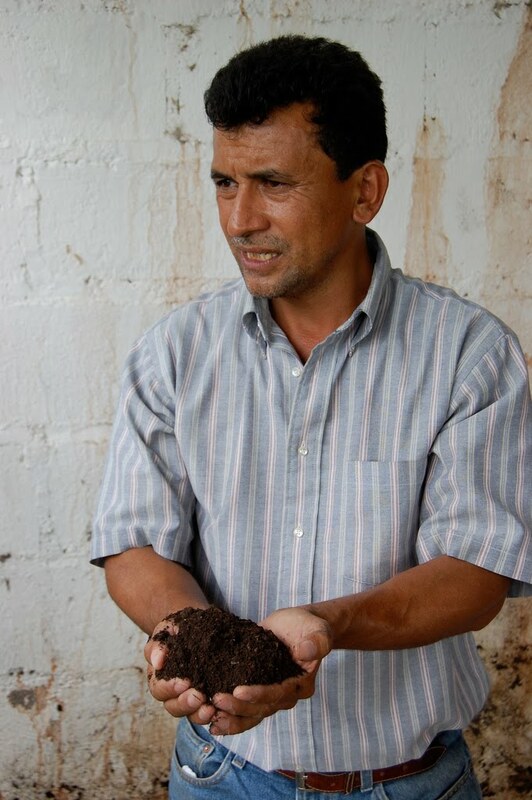 Up until the very end of the training session, Eved, Marco, and Nelson were busy shoveling a mixture of calcium, cow manure, wood shavings among a host of other materials alongside coffee farmers from Malcincal, Gualciras, and San Bartolo. For me, it is very inspiring to see some, if not all of the students, dedicating their lives to the development of La Union and the surrounding villages. Sure, organic training may not enlighten everyone, but as we began explaining to them their second role in our partnership, levels of excitement grew. Union MicroFinanza distributed survey grids among groups of two and three students. These students will visit each one of our client communities, to speak with each one of our producers, survey their current harvest, observe any diseases causing harm to their harvest, and any proposed ideas of organic crops, in order to bring us back an assessment of each producer’s finca (coffee field), milpa (corn plantation), or frijolera (bean harvest). Within these colegio students, following the career of Social Promoter, I can begin to see the composition of La Union’s future leaders. These are leaders, only too necessary in an area thirsting for development. And it’s a beautiful thing watching the youth of La Union help themselves, their families, their friends, and their neighbors. If what we’re doing with them is only to fulfill a graduation requirement: fine. But what I believe lies beneath the surface of our partnership is to begin to introduce young minds to the poverty that lies beyond the relatively prosperous bubble of La Union so they can witness an endless array of mud-brick homes, inadequacies of water, deficiencies of electricity, malnutrition of children, among an array of other hurdles burdening social development. In the end, it’s refreshing gringos aren’t the only ones trying to improve the lives of our mountain neighbors. Young catrachos (Honduras) realize the necessity for growth and are actively pursuing careers to enable them to do so.